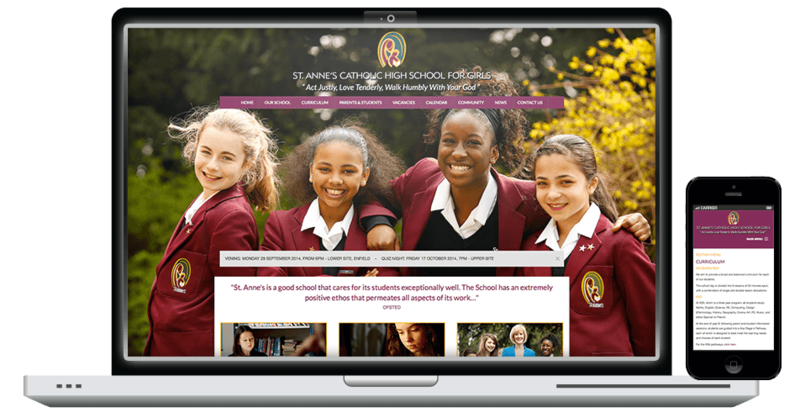 Last week we have launched a brand new bespoke website for St Anne’s Catholic High School in London and we are very excited to be able to now showcase it! St Anne’s School approached us in early 2014 to look over there existing website which was not only dated but didn’t provide a great user experience to current and prospective students of the school. With OFSTED now inspecting school websites, it was fundamental their website reflected the high quality service the school provides to its students. After being commissioned to redesign and build the website from scratch we began getting down to business; creating a bespoke design that would give users of the website a great and easy to use experience and developing all of the components. We consulted carefully with staff across all departments and put together wireframes of what the core site needed to include, and went ahead with creating initial concepts until the head teacher approved the final design. With various further consultations along the way with staff, we were able to design St Anne’s a new fresh looking website that encompassed all the required features necessary for a modern Secondary School whilst keeping the site user friendly. We incorporated a responsive design allowing the website to scale to fit the screen size of tablets and mobiles giving prospective and current students a great experience no matter what device they decided to use, as well as incorporating social media throughout and strong imagery, giving the website a distinctive look.